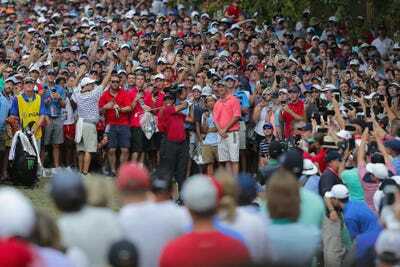 Richard Heathcote/Getty ImagesThe PGA Championship showed that Tiger Woods may be more popular than ever. For the second straight major, Tiger Woods was in contention, finishing second to Brooks Koepka at the PGA Championship over the weekend. Fans in St. Louis flocked to Woods all week, and roars were heard even when his score was updated on the leaderboard. One scene in particular after the 18th hole showed that Woods is still the biggest rock star in sports and may be more popular than ever. Brooks Koepka won his third major at the PGA Championship on Sunday, but the star of the show at Bellerive Country Club in St. Louis was Tiger Woods. After sitting out with an injury or missing the cut at 15 of the previous 18 majors, Woods was in contention over the weekend for a second straight major. But while his run at the British Open was fun, his second-place finish at the PGA Championship felt different, and that was due in large part to his fans. All weekend, fans flocked to the course or TVs to see Woods – and if they couldn’t see him, they roared when his score was updated on the leaderboard. While Woods still hasn’t won a major in a decade, one scene at the PGA Championship in particular solidified his return as the biggest rock star in sports. It came as he finished his final round and walked off the green to a bridge that took the players to the clubhouse. When Woods walked across the platform and waved, the crowd went bonkers. Keep in mind: Nobody was playing the ninth hole at the time. Koepka talked about the noise for Woods after the round. Eric McHugh, a St. Louis TV cameraman, told Michael Bamberger of Golf magazine the intensity of the crowd was unlike anything he had ever seen at a sporting event. “This was more than that,” he said.